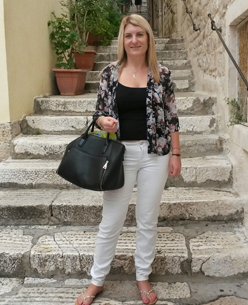 "I joined Premier Travel in 2001, always been at St Ives branch after completing my Tourism course in College. Little did I know I would still be here all these years later, continuously getting a buzz from creating the perfect itinerary for my clients. I love the feeling I get from securing the right holiday for someone, and the thrill I get from planning my own trips. It's great for inspiration!" "I have been lucky enough to travel the world. Malaysia holds special memories for me as it was my first long-haul flight. I have been snorkeling in the Caribbean, Camel riding in Dubai and have been all the way to Australia for a week tour!. I recently went to Thailand, Hong Kong, Egypt and a lots of short haul destinations like Spain, Cyprus, Turkey, Amsterdam, Barcelona and more!. I also love nothing more than planning weddings abroad and even got to experience one I booked when my sister got married on the Greek Island of Kos! It was fantastic being involved from start to end. I have also done many trips all over Italy, and I really enjoy tailor making Italian holidays so that I can share my passion and knowledge of the places I have visited. I have been to Rome twice and would go back tomorrow! The Tuscany coast and the Neapolitan Riviera are both really beautiful, but one place I have on my future tick list is Venice." Since having children I like to enjoy family friendly beach holidays in places like the Balearics and Canary Islands, however as I recently took them to Thailand I hope to continue more long haul destinations. I really hope to take them to see the Orangutans in Borneo. Where to start!! South Africa, China, California, Vietnam, New Zealand. Grenada was absolutely beautiful too – white sand beaches that you imagine on a postcard." "Elephant Hills in Thailand – I took my children age 7 & 4 and they were so fascinated, an experience none of us will ever forget. We washed them and fed them, it was brilliant getting up close and personal. Also swimming with Sting Rays in the Cayman Islands – I was scared at the time but it was an amazing experience and I'm proud of myself for doing it - I'd recommend it to anyone!" "Wear ear plugs on the plane – if you're a nervous flyer, it will calm you down before take-off and landing." "I go the extra mile and will always offer my own personal opinion – I'm great at finding bargains too!" "Your travel adaptor! Invest in a worldwide one and you'll be able to use it everywhere you go."